Preheat your oven to 350. Brown ground beef and drain. Stir soup mix and flour into the beef in the skillet. Add water and continue cooking until the mixture thickens. Spoon the beef mixture into a 9x9 baking dish. Sprinkle the cheddar cheese over the beef mixture. Arrange the tater tots over the cheese. 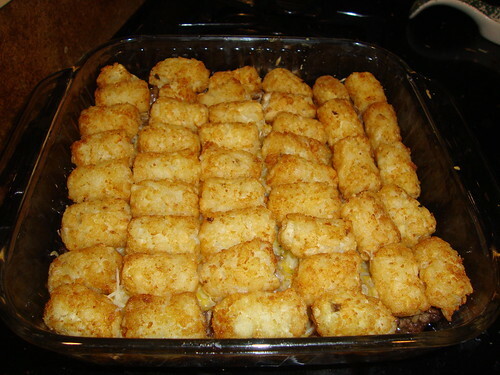 Bake until the tater tots are golden and the mixture is bubbly (about 30 - 40 minutes).